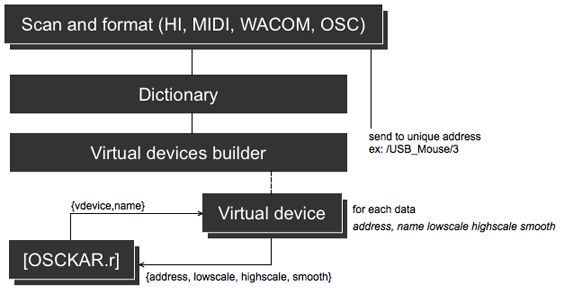 OSCKAR is a tool that allows you to quickly use data coming from various hardware devices and network (HI, MIDI, Wacom, Keyboard, OSC, other messages) inside your own patches. It's developed for La Grande Fabrique, Dieppe, France. 1 - How it works ? OSCKAR generate an unique symbol referencing each incoming data. This unique symbol is OSC formatted (but not used as OSC yet). examples :/MPK_Mini/1/ctl/1 would be control 1 on channel 1 of my Akai MPK Mini./MPK_Mini/1/notes would provide a list [pitch velocity] from channel 1 of the MPK Mini. OSCKAR can also generate new data, re-use them in virtual devices, and share them over the network with other OSCKARs. 2 - Great ! Then ? then, OSCKAR provide an virtual device builder, this allows you to aggregate data from different controllers to build your own virtual device. When building a virtual device you can choose as many data as you want, define scale and smooth settings for each of them, and rename them to have a human readable list of controls. note : you can't use twice the same control in a virtual device, but you can use the same control in different virtual devices, with different scale and smooth settings. 3 - OK, I have built my virtual device, how do i use it ? Once you're done building your device, just use the [osk.r] abstraction to access data from your patches. See the help file of osk.r for a complete description, or just double-click it to easily map a data. OSCKAR comes with a template "instrument" (it's a patch OSCKAR can communicate with). 4 - Hey I've developed many instruments using your great tool. But it's a pain to activate/deactivate them ! No problemo ! OSCKAR has been designed to help you switching instruments on-the-fly ! With what I called "scenes" you can build an instruments bank, navigate inside your bank, and choose to activate/deactivate what you want. And these operations can be mapped on controls coming from your devices ! No need to touch your computer when playing live ! - OSCKAR is still under high development and the specifications are subject to change, but I'd be glad to have some feedback from some maxers at this point. - A more complete user guide should be written within some weeks. - Virtual devices are NOT cross-platform. I've removed the pattrstorage system from the instrument and osk.r abstraction. it was not reliable enough. we are currently thinking a new solution for mapping presets. for the moment, use osk.r with attributes to init the instrument with correct values. [osk.r @vdevice my_device @vctl a_ctl]. introducing the [osk.kernel] abstraction. the minimal osckar. all you need to develop faster with external devices.